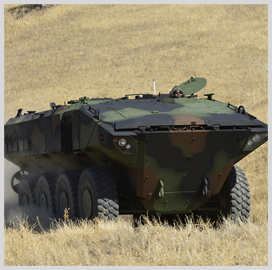 A BAE Systems–Iveco Defence Vehicles team has beaten the team of Science Applications International Corp. (NYSE: SAIC) and ST Kinetics for a potential $1.2 billion U.S. Marine Corps contract to build amphibious combat vehicles. BAE said Tuesday it will aim to deliver the first 30 ACVs under the contract that has a $198 million initial value and contains options for the delivery of 204 vehicles in total. Work under the ACV 1.1 program will occur in Minneapolis; San Jose, Calif.; York, Pa.; Sterling Heights, Mich.; Aiken, S.C.; and Stafford, England. The BAE-Iveco team will build an eight-wheeled ACV equipped with a six-cylinder, 700-horsepower engine and designed to operate across all terrains and protect three crew members and 13 Marine passengers from blasts. The partnership tested its vehicle offering’s swim capabilities, survivability and land mobility performance before handing over 16 increment 1 prototypes to the service branch in 2017 as well as supported the branch’s developmental testing and operational assessment. SAIC received a $121.5 million contract in November 2015 to build vehicle prototypes under the program’s engineering, manufacturing and development phase.